Banff, 01, Canada - 1 person likes this. Explore the most visited canyon in the Canadian Rockies in Banff, Alberta. Visit beautiful Johnston Canyon with amazing views of the cascades, waterfalls and the breathtaking upper falls. Take on a unique Ice Walk to Johnston Canyon in the Canadian Rockies and get to experience a hike in which you’ll get to see amazing views and not to mention, on ice. On this tour, you’ll get to have a better view at the cascades, waterfalls, and the breathtaking upper falls so you can fully admire each one’s beauty. Being one of the most visited canyon in the Canadian Rockies, we can safely say that it will not disappoint your vacation in Banff, Canada. Ice Walk to Johnston Canyon is an approximate 4-hour long ice adventure, hiking from the lower falls to the upper icefalls. You will later on walk through the prime wildlife habitat on your way to the stunning upper icefalls. You will have a total of 7 waterfalls and icefalls to visit on this tour so make sure you bring your camera with you to capture their unspoiled beauty. You and the group, of course will be accompanied by an expert and friendly guide to ensure you a safe, fun, and memorable tour in Banff, Canada. Also, you might want to consider having your kids with you, the tour being a hike on ice, they probably won’t feel comfortable as much as with the adults and teens. 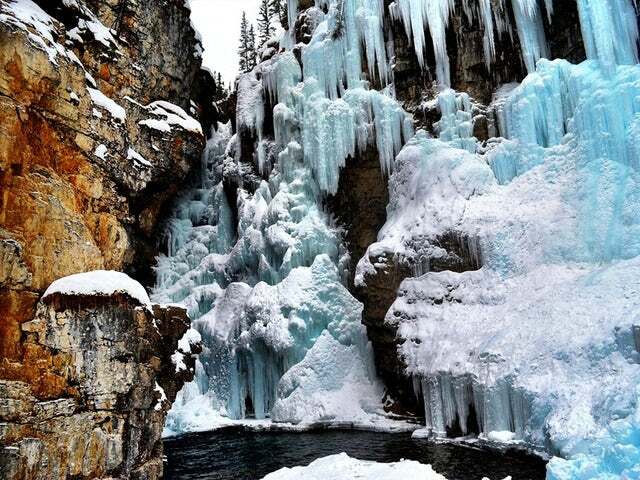 Call us now and get to experience a hike with spectacular sights on ice with Ice Walk to Johnston Canyon!